These words of Jesus must have pierced the heart of our Blessed Mother deeply. She stood close to Him, gazing at Him with love, adoring His wounded body given for the world, and she heard this cry coming forth from the depths of His being. “My God, my God…” He begins. As our Blessed Mother listened to her Son speak to His Father in Heaven, she would have found great consolation in her knowledge of His intimate relationship with the Father. She knew, better than anyone else, that Jesus and the Father were one. She had heard Him speak this way in His public ministry many times and she also knew by her motherly intuition and faith that her Son was the Son of the Father. And before her eyes Jesus was calling out to Him. But Jesus went on asking, “…why have you abandoned me?” The sting to her heart would have been immediate as she sensed the interior suffering of her Son. She knew He was experiencing far more pain than any bodily wound could inflict. She knew He was experiencing a profound interior darkness. 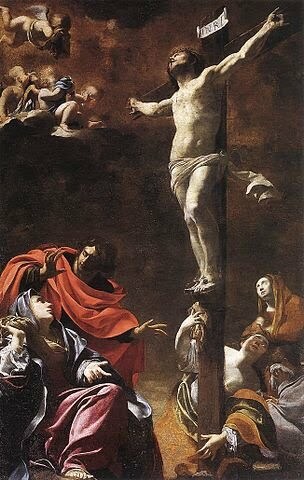 His words spoken from the Cross confirmed every motherly concern that she had. As our Blessed Mother pondered these words of her Son, over and over in her heart, she would have come to understand that Jesus’ interior suffering, His experience of isolation and spiritual loss of the Father, was a gift to the world. Her perfect faith would have led her to understand that Jesus was entering intothe experience of sin itself. Though perfect and sinless in every way, He was allowing Himself to be drawn into the human experience that results from sin: separation from the Father. Though Jesus was never separated from the Father, He entered into the human experience of this separation so as to restore fallen humanity to the Father of Mercies in Heaven. As we ponder this cry of pain coming forth from our Lord, we must all seek to experience it as our own. Our cry, unlike our Lord’s, is a result of our sins. When we sin, we turn in on ourselves and enter into isolation and despair. Jesus came to destroy these effects and to restore us to the Father in Heaven. Reflect, today, upon the profound love our Lord had for all of us in that He was willing to experience the consequences of our sins. Our Blessed Mother, as the most perfect mother, was with her Son every step of the way, sharing His pain and interior sufferings. She felt what He felt and it was her love, more than anything else, that expressed, and stood in for, the steadfast and unwavering presence of the Father in Heaven. The Father’s love was made manifest through her heart as she gazed with love at her suffering Son. My most loving Mother, your heart was pierced with pain as you shared in your Son’s interior suffering. His cry of abandonment was one that expressed His perfect love. His words revealed that He was entering into the effects of sin itself and allowing His human nature to experience it and redeem it. Dear Mother, stand by me as I go through life and feel the effects of my own sin. Though your Son was perfect, I am not. My sin leaves me isolated and sorrowful. May your motherly presence in my life always remind me that the Father never leaves me and is always inviting me to turn to His merciful Heart. My abandoned Lord, You entered into the greatest agony any human could enter. You allowed Yourself to experience the effects of my own sin. Give me the grace of turning to Your Father every time I sin so that I may merit the adoption won for me by Your Cross.